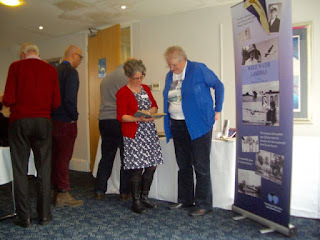 As mentioned last month, Jemima attended the 'Flying through the Thirties' symposium at Croydon Airport, where her display of her father's archive was well received. Among things mentioned were the Q code system of communication - and the manual is in the archive. The book White Water Landings caught people's attention, too. There are plans to attend a Croydon Airport Museum Open Day in September or October. Camp NaNoWriMo has given Jemima the impetus to get on with Book 2 of the Viridian System series - it still lacks a title, but it has reached about 82% of the anticipated word count. Jemima comments: "It's a lot of adventure, with some mystery and plenty of twists, but I need to work on the action element once it gets to the editing stage." Yes, that's a first draft for you! Jemima plans to do Camp NaNo again in July to focus on the seventh Princelings book - provisionally called The Chronicles of Willoughby the Narrator. Watch out for a Goodreads Giveaway next month - Bravo Victor will complete the romp through the Princelings paperbacks. I couldn't find your A to Z posts Jemima. However, thanks for all the visits.